Our food includes different types of nutrients, vitamins and other things (food additives). Some of these protect us against cancers where as others increase the risk. Knowing that dietary factors also play a significant role in cancer risk, it is important to know whether the food we are eating nourishes our body, protects us from disease or is harmful to us. 1 out of 10 cancers (10%) may be linked to diet and over half of these are caused by eating less than 5 portions of fruit and vegetables a day . Diets rich in saturated fats (400gm) , salt and poor in fiber are associated with increased risk of cancer. The people who eat more of red and processed meats are more likely to develop stomach and bowel cancers [2-4]. The way we cook might also increases our cancer risk. Chemicals are released when we cook food at high temperatures which can damage body cells putting them at risk to become cancerous . Some studies have shown that the calcium in milk reduces the bowel cancer risk while others have linked high intake of dairy proteins with prostate cancer . Most additives, colors, flavors and sweeteners have not been found to increase the risk of cancers [1,7]. Even in small quantity processed food, Alcohol can increase the risk for a number of cancers including that of liver, mouth, bowel, throat, food pipe and breast [1,4]. 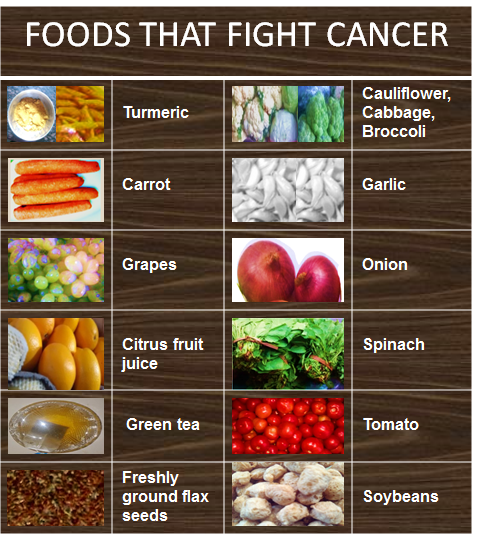 Other Indian foods associated with cancer risk are high rice intake, spicy food, excess chilly consumption, use of soda and consumption of dried salted fish . Insoluble grain fiber in coarse grains (e.g., rye, sorghum, maize, barley and millets) . Micronutrients like vitamins and trace elements . Vitamins A, E, and trace minerals such as selenium, zinc . Vitamin-D and calcium are also found to give protection against colorectal cancer . Green tea and its compounds . Retinoids (found in orange and red vegetables and fruits like sweet potatoes, mangoes, pumpkins, peaches and carrots) have been found to inhibit cancer growth in epithelial tissues . 13-Cis-Retinoic acid is used in the treatment of skin and cervical cancers . High intake of Beta-Carotene rich foods decrease the incidence of esophageal cancer. National Institute of Nutrition (NIN) recommends a diet (min 400gm) that includes high intake of fresh vegetables, fruits, garlic and spices such as turmeric in adequate amounts for cancer prevention . A diet high in carotenoids, vegetables, and fruits may reduce the risk of cervical, ovarian, and endometrial cancers. High intake of vitamins C and E may reduce the risk of cervical cancer. Intake of more of saturated fats and obesity have been linked to breast cancer. The nutrition guidelines and the World Cancer Research Fund recommendations advocate that having a diet with liberal amount of vegetables and fruits, less of saturated fats decreases that risk of breast cancer. Increased consumption of fish, eggs, raw and cooked vegetables, and fruit is associated with a decreased risk of oral cancer. 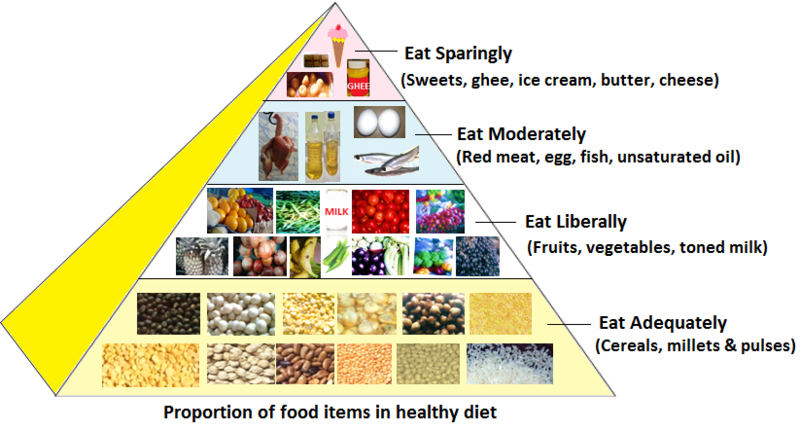 1- Eat whole grain bread, cereals, poultry products, fish and soya. 4- Limit eating high calorie baked foods (cakes, cookies, doughnuts). Read about high calorie foods. Chemicals in Meat Cooked at High Temperatures and Cancer Risk. National Cancer Institute. Mathew A, Gangadharan P, Varghese C, et al. Diet and stomach cancer: a case-control study in South India. Eur J Cancer Prev 2000;9:89-97..